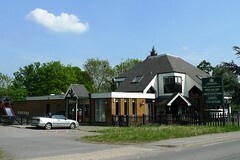 Greene King pub at the western edge of Ruislip. It was built in the 1970s on the site of an older pub with the same name, and looks pretty much as you might expect for something of that era. A patterned carpet covers the floor, and some of the seating is up on a dais protected by shiny brass rails. A central domed glass lighting feature in front of the bar photo provides some interest. There's also a pool table, and a fair bit of outside seating including a small play area for children. Kake and Ewan visited on a Wednesday afternoon in May 2011. There were a few people in, and service was friendly. Music was playing (vintage Madonna). Although they have three handpumps for real ale, they were all clipped for Abbot Ale. Unfortunately, Kake's half of this was sour; the staff member behind the bar took it back immediately and provided Strongbow instead, but didn't turn the clip around as he should have. According to a sign seen outside in May 2011, food is served noon-2:30pm and 5:30pm-8:30pm Mon-Fri; noon-8:30pm Sat; and noon-3:30pm Sun. Accessibility: A ramp to get in, and level access to the bar, toilets, and much of the seating once you're in. There are a few disabled parking spaces outside. Last visited by Kake and Ewan, May 2011. Opening hours taken from sign outside, May 2011. Last edited 2013-05-10 06:48:38 (version 2; diff). List all versions. Page last edited 2013-05-10 06:48:38 (version 2).